Bring your family and friends in town for Thanksgiving weekend to (literally) Take Another Look — at Buffalo — from the best vantage point – the 25th and 28th floor Observation Decks of our historic, Art Deco City Hall to see and celebrate the resurgence. Cranes on the Buffalo Niagara Medical Campus. HARBORCENTER. Canalside and the re-watered canals. Larkinville. RiverWorks. Solar City. The Outer Harbor. There is so much progress to see. And it is all visible from the City Hall Observation Decks on both the 25th and the 28th floors. 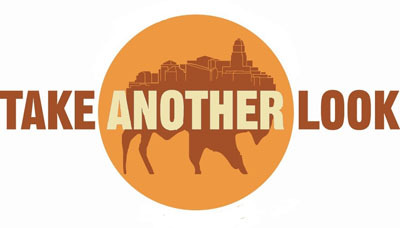 But Take Another Look offers additional views of Buffalo, as well. In the vaulted Lobby, the Take a Taste of Buffalowill feature appetizers from our downtown eateries, Take a Sip of Buffalo will showcase the growing number of craft beers and local wines, the BuffaLove Fair will offer Buffalo-themed gifts designed to remind all of home, Opportunity Hall information tables will feature career opportunities and information about our city’s many successes, and Preservation Buffalo Niagara docents will offer complimentary 15-minute mini-tours of the magnificent building itself. Katie and Ed, WKBW-TV on-air personalities, will keep the event moving as emcees in this beautiful space. Then & Now Buffalo videos clearly illustrating our resurgent Buffalo will be screened in the elegant Council Chambers on the 13th floor, and guests can play the Name that Place quiz, with prizes for winners. There will also be What I Love About Buffalo video story-telling by guests, audio interviews as part of the NPR Story Corps The Great Thanksgiving Listen that will be posted locally and archived in the American FolkLife Center at the Library of Congress, a What I Love About Buffalo post-it note opportunity and Buffalo-themed crafts for the little ones compliments of UHAA on the 13th floor. Aspire Technology Today’s award-winning Buffalo photographs will be exhibited in the 25th floor handicap-access Observation Deck Windows on Buffalo, as will art by PS 84 students, along with panoramic views of the city. Many will Take Another Look from the 28th floor Observation Deck, where coffee and desserts will represent the sweet resurgence seen below. Docent-led 15-minute aerial tours of Buffalo from both the 25th and the 28th floor Observation Decks will be available compliments of Explore Buffalo. All guests are welcome to enjoy the beautiful vistas and the sun setting over Lake Erie. We thank the Buffalo Common Council and Citi for their Sponsorship of this unique Citybration event. Nearly 1,000 guests attended Take Another Look in 2014. We expect to double this number in 2015. Celebrate the resurgence at the second annual Citybration Take Another Look Sunset Reception atop City Hall!